Description: The male and female flowers grow on separate plants and are very inconspicuous. What is noticeable on this plant are the showy, colourful bracts, which are leaflike or scalelike parts, located on the inflorescence. Leaf: 5–35 mm, grey-green with a rounded apex and tapering base. Range: High Sierra Nevada (e slope), Tehachapi Mountain Area, s Inner South Coast Ranges, Western Transverse Ranges (n slope), Great Basin Floristic Province, Mojave Desert, nw Sonoran Desert. Distribution outside California: to Washington, Montana, New Mexico. Habitat: Sandy to gravelly, Creosote Bush Scrub, Pinyon-Juniper Woodland. Notes: A common shrub that is native to California and is also found outside of California, but is confined to western North America. 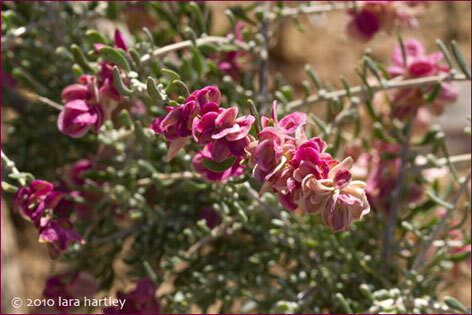 Hop Sage is closely related to Desert Holly. Cattlemen considered this a valuable forage plant. It can be found along Kelbaker Road near Interstate 40 in the Mojave National Preserve as well as along Highway 395 where this plant was photographed on Haiwee Power Plant Road. Horticulture: Insufficiently tested, but worth pursuing, especially within its natural range. Especially good for stabilizing or restoring disturbed or degraded areas. May be less suitable for general garden use.